The concept of the digital phenotype has been used to refer to digital data prognostic or diagnostic of disease conditions. Medical conditions may be inferred from the time pattern in an insomniac’s tweets, the Facebook posts of a depressed individual, or the web searches of a hypochondriac. This paper conceptualizes digital data as an extended phenotype of humans, that is as digital information produced by humans and affecting human behavior and culture. 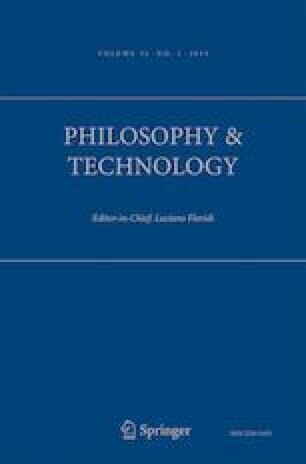 It argues that there are ethical obligations to persons affected by generalizable knowledge of a digital phenotype, not only those who are personally identifiable or involved in data generation. This claim is illustrated by considering the health-related digital phenotypes of precision medicine and digital epidemiology. Part of this work was done while ML was a scientific collaborator at ETH Zurich. Aicardi, C., Savio Del L, Dove, E. S., Lucivero, F., Mittelstadt, B., Niezen, M., Prainsack, B., Reinsborough, M., and Sharon, T. (2016a). Shortcomings of the Revised ‘Helsinki Declaration’ on Ethical Use of Health Databases. The Hastings Center. November 2, 2016. http://www.thehastingscenter.org/shortcomings-world-medical-associations-revised-declaration-ethical-use-health-databases/. Kelion, L. 2017. Facebook Uses AI to Spot Suicidal Users. BBC News, March 1, 2017, sec. Technology. http://www.bbc.com/news/technology-39126027. Malik, M M., Pfeffer, J. (2016). Identifying Platform Effects in Social Media Data. In Tenth International AAAI Conference on Web and Social Media. http://www.aaai.org/ocs/index.php/ICWSM/ICWSM16/paper/view/13163. Mittelstadt, B. (2017a). Designing the health-related Internet of things: ethical principles and guidelines. Information 8 (3). http://www.mdpi.com/2078-2489/8/3/77htm. Regulation on the Protection of Natural Persons with Regard to the Processing of Personal Data and on the Free Movement of Such Data, and Repealing Directive 95/46/EC (General Data Protection Regulation 2016/ 679). (2016). http://eur-lex.europa.eu/legal-content/EN/TXT/?uri=uriserv:OJ.L_.2016.119.01.0001.01.ENG&toc=OJ:L:2016:119:TOC. Vayena, E., Dzenowagis, J, Langfeld, M. (2016). The Health Data Ecosystem and Big Data. WHO. 2016. http://www.who.int/ehealth/resources/ecosystem/en/. WMA - The World Medical Association. (2016). WMA Declaration of Taipei on Ethical Considerations Regarding Health Databases and Biobanks. Website of the WMA. October 22, 2016. https://www.wma.net/policies-post/wma-declaration-of-taipei-on-ethical-considerations-regarding-health-databases-and-biobanks/. Zignani, M, Gaito, S, Rossi, G P, Zhao, X, Zheng, H, Zhao, B Y. (2014). Link and triadic closure delay: temporal metrics for social network dynamics. In Eighth International AAAI Conference on Weblogs and Social Media. http://www.aaai.org/ocs/index.php/ICWSM/ICWSM14/paper/view/8042.